All the information given below is provided by the heir who possesses this treasure as stated in a will. 1. The owner of this bottle - a unique piece in Romania and most likely all over the world was Emil C. Brudariu, born on September 30, 1895, in DOBROVĂŢ, CRASNA rural district, county of VASLUI – ROMANIA. 2. Emil C. Brudariu graduated from The School of Horticulture at Herăstrău – Bucharest, the first higher education establishment in agriculture founded by Professor Dr. docent Ionescu Siseşti. 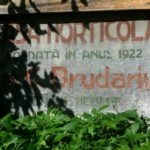 After graduating, in 1914, Brudariu worked as a “horticulturist” on the royal estates in Bucharest. During that period, owing to the initiative of King Carol I of Romania and under His Majesty’s auspices – the Royal House distributed a number of “Mott 1914” bottles of wine to all the employees on the Royal Estates. Emil C. Brudariu kept one of these bottles as a memento. Here, the reader would need some further details. 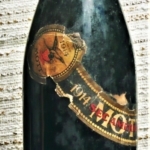 This type of sparkling wine, in fact a special order placed by the Royal House with the American winemakers “Mott 1914”, was given to the employees during the last days of the reign of King Carol I as a token of appreciation and gratitude (and probably honour) for the quality of their services on the job. King Carol I died on October 16, 1914, and the successor to the throne, King Ferdinand, was crowned as the First King of all Romanians in Alba Iulia in 1922. 3. Interestingly enough, this authentic object has survived the decades from two reasons: the former owner, who died on January 6, 1981, carefully kept it. The heir has cherished it equally since he inherited the bottle in 1983, when Reghina Maria Brudariu, Emil Brudariu’s wife passed away. 4. From a historical viewpoint, this bottle has survived the tormented history of Romania ever since 1914 – that is one hundred year old bottle – a lifetime. The tormented history of Romania means in fact the tormented history and life of Romanians, of a whole people whom Emil C. Brudariu belonged until to his demise in 1981. 5. At the age of 21, in 1916, when Romania entered the First World War, Emil C. Brudariu was drafted. He fought during the war as a sergeant until its end, in 1918. 6. For his conduct during the war, he was awarded such medals as: - “Bărbăţie şi credinţă” [Resoluteness and Faith] - “Virtutea ostăşească” [Soldierly Virtue]; - “Avântul Ţării” [Upsurge of the Fatherland] - “1916-1918 Commemorative Cross,” and - “1922 Coronation in Alba Iulia”. 7. In 1919 he came to Piatra-Neamt and was employed as a horticulturist by the Boyer Lalu, owing to his diploma granted in Bucharest and to his previous experience on the Royal Estates. 8. In 1922, he parted with the Boyer Lalu – one of the distinguished citizens of Piatra-Neamt at the time and set forth his own enterprise called “Horticultural House Emil C.Brudariu.” 9. An entrepreneur in his own right, Emil C. Brudariu finds among the well off families the chosen one – Reghina Maria, the daughter of Matei and Ana Anastasiu - whom he marries in 1925. In the beginning, the young couple lived in a rented house in Vînători, on the outskirts of Piatra-Neamt, now a district of the town. 10. When he thought he was quite well off, Emil Brudariu bought a piece of land where he built a house in 1929 which is now located in the center of the municipality of Piatra-Neamt. Brudariu used the land around the house to grow flowers. Between 1922 and 1944, Emil C. Brudariu was the producer and supplier of natural flowers for the people in the town and the surrounding villages as well as for the local administration. At the time, the green areas in the town were managed and maintained by the “Emil C. Brudariu Horticulture House” set forth in 1922 as a private company. The local administration did not have a specialized department for landscaping. 11. In 1923, one year after entering the flower market, Emil Brudariu starts a flower publication called "The Small Garden" funded by his own company. This publication was meant to increase the public awareness of theoretical and practical horticultural sciences addressed mainly to the private vegetable, fruits, and flowers growers for their own household or for trade. The review represented the ‘Piatra-Neamt stock market’ newsletter as it included prices for all horticultural produce – fruits, vegetables, vine, flowers, etc. Some of the issues of this review can be seen in the “G. T. Kirileanu” County Library in Piatra-Neamt. 12. In 1938, the Town Hall of Piatra Neamt acknowledges Emil C. Brudariu’ merits and efforts and awards him a 300-square-meter piece of land in Carol I Street in Piatra-Neamt. 13. Romania’s fate after the Second World War is well known by everyone. It is worth mentioning though the post-war regime changed the life of Emil Brudariu – who had fought in the Great War for the creation of the Greater Romania – in two ways: a) Firstly, the farming land areas decreased gradually since 1954 due to the town planning and landscaping, hence the basis of production diminished and as well Emil Brudariu’s means of self-sustainability. b) Secondly, the procedures for licensing private producers underwent changes, hence such licenses were granted only by the “local councils” and not by the Ministry of Agriculture as in the 1920s. Quite miraculously, one of these documents – i.e.. License No 135 of 08/08/1971 - has survived. 14. Emil C. Brudariu endured hard the changes brought along by the Communist regime in Romania. Nonetheless, some citizens of Piatra-Neamt, who occupied important positions in the party ranks, but also admired Emil Brudariu’s life and work decided to have a jubilee documentary made - “A 50-Year Service to Flowers and to the Town of Piatra-Neamt” – in 1972; the documentary was broadcast both on the radio and on the National TV Channel. 15. Emil C. Brudariu’s enjoyed very little acknowledgment of his merits from the local administration and ever lesser help in his old age. One of the former first secretaries of the Local Council in Piatra-Neamt, before 1989, insisted in having Brudariu’s house pulled down. But Emil C. Brudariu finally was granted clemency to his many petitions to postpone demolishing until after his death. 16. Still, his house was not demolished after all as many kind-hearted people working with various institutions or in even higher positions, who had held Emil C. Brudariu in high esteem, managed to list the house as “Birthplaces in Piatra-Neamt”. On the other hand, the town planning officials excluded from demolition the house of the one whom everyone had bought flowers from for different ceremonies – baptisms, weddings, etc. – around the clock. 17. Emil C. Brudariu had permanent connections throughout his life with former colleagues who had left the country to live abroad. One of them was Luis Faradou, who settled in Venezuela, and with whom Brudariu exchanged letters until the demise of the former. It worked as a moral support as all plant material brought along from his travels abroad (tulip bulbs from the Netherlands, for instance) was paid by himself. 18. In 1981, on January 6, Emil C. Brudariu passed away. His wife and heir, Reghina Maria, was to join him two years later, on February 23, 1983. 19. In Brudariu’s last will and testament, after his wife, the inheritance passes to the undersigned. I am writing this story, as I would like to put the precious 1914 bottle of wine to a better value, which would enable me to restore Brudariu’s birthplace - “Emil C. Brudariu Horticultural House”, to open his household to visitors and to find a better place for it within the historical area of the municipality of Piatra-Neamt. As Brudariu’s sole heir, I have possession of various other items with cultural and historical value which would provide information - to the younger generations - related to this honourable citizen’s work and life and his equally honourable contemporaries such as G. T. Kirileanu (custodian of the Royal Court Library until 1944-1945), Anton Vorel (a renowned forerunner of herb-based drugs). 20. There are two documents that I consider highly relevant for myself. They are official documents that stand proof for the future generations: a) The Letter of Complexul Muzeal Judeţean Neamt [Neamt County Museum], ref No. 82 of 01/02/1985, and b) The Letter of Ministerul Culturii şi Cultelor [Ministry of Culture and Cults] Ref. No 5604-MI of 04/07/2006. These two documents certify the lawful heir, “general devisee and legatee”, or, in other words who has possession of the 1914 wine bottle. 21. I can value this item via Internet, based on a bid as the starting amount could be affordable only to well-off collectors, or any other rich person who would like to have a hundred-year-old wine in their collection. This is why I decided to share the brief history of this 1914 bottle of wine. It is more likely to seem attractive to a buyer from the USA as “MOTT 1914” was an American company. 22. The undersigned have a BRD – Groupe Société Générale – Branch of Piatra-Neamt MAESTRO card No 6764032018822870. 1. The Record as a “completaşi” [i.e., a soldier who after having completed his service was kept in the military records for a certain amount of time before being put to reserve]; 2. Certificate for the medal “Bărbăţie şi credinţă” [Bravery and Faith]; 3. Certificate for the medal commemorative cross 1916 – 1918; 4. Certificate for the medal “Victoria” [Victory] 1916-1918; 5. Order for disbandment; 6. Order of emergency call to the [military] unit; 7. A letter form the State Archives Bucharest concerning work experience; 8. Note of disbandment, typed; 9. Letter from the Museum Complex of Piatra Neamt; 10. Medal “Virtutea ostăşească” [Soldierly Virtue]; 11. Medal “Bărbăţie şi credinţă” [Bravery and Faith]; 12. Medal “Avântul Ţării” [The Momentum of the Country]; 13. The commemorative cross 1916 – 1918; 14. The Medal of the 1922 Coronation in Alba Iulia. These documents and insignia stand witness to Emil BURDARU’S participation in the First World War, which paved the way to the construction of the Romanian national unitary state. Their display in the museum is meant to remind us of our national heroes.